Roger Federer Captured his fourth Miami Open title by defeating defending champion John Isner in straight sets. Ashleigh Barty defeated No. 5 seed Karolina Pliskova 7-6(1), 6-3 to win the Miami Open title. Monday’s matches in Miami will feature Roger Federer, Petra Kvitova, Simona Halep and Venus Williams. Defending John Isner is back on court at the Miami Open on Sunday. Novak Djokovic and Nick Kyrgios will also be competing to extend their stay in South Florida. Roger Federer figures out qualifier Radu Albot in order to advance to the third round at the Miami Open. Compatriot Stanislas Wawrinka knocked out in three sets by Filip Krajinovic. Naomi Osaka's run at the Miami Open came to a halt in the third round as Su-Wei Hsieh stopped the world number one 4-6, 7-6, 6-3 to book her first showing in the round of 16. Eight time champion Serena Williams was forced to cut her tournament short due to injury. Serena Williams and Naomi Osaka made to work to secure their place into the third round at the Miami Open. Novak Djokovic starts his campaign for a seventh Miami Open title on Friday. John Isner also takes court with the goal of a second consecutive masters 1000 title in South Florida. 2019 Indian Wells winner Bianca Andreescu energized by a partisan crowd dug out of a 4-6, 1-5 hole to defeat Irina Begu. Venus Williams and Petra Kvitová had minimal trouble in advancing to the next round at the Miami Open. Samantha Stosur shocks Madison Keys in three sets. Venus Williams, Petra Kvitova, Madison Keys and Victoria Azarenka in action Thursday at the Miami Open. 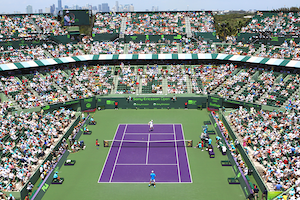 As the Miami Open inaugurates a new site, the spectators can look forward to the same thrills as Novak Djokovic, Roger Federer and Serena Williams hold court the next fortnight. Roger Federer will join Novak Djokovic, Rafael Nadal, Alexander Zverev, Juan Martin del Potro and John Isner at the 2019 Miami Open. Novak Djokovic dispatches Rafael Nadal 6-3, 6-2, 6-3 to grab his 7th Australian Open championship, his third major in a row. Novak Djokovic hits a winner against Rafael Nadal during 2011 Miami Open Final.